Remember when having multiple browsers was a requirement for desktop computing? Most users should be past that point. The default browsers for each operating system — Safari on macOS, Microsoft Edge/Internet Explorer 10/11 for Windows, Chrome for Chrome OS, and Firefox for Linux — are now good enough that it’s usually not necessary to immediately download a second browser on OS install. Like desktop operating systems, the browser has iterated into a stable platform for (web) applications to build atop it. From a business standpoint, the investment justification to build a new browser is iffy at best. Other than Firefox — which has primarily sustained itself on major search deals — each of the browser makers are incentivized to build and enhance their browsers to increase usage in their own operating systems, to control the gateway to the web so that another company cannot play middleman. There hasn’t been another proven way to survive when the biggest tech companies can afford to subsidize their development costs; Opera had to sell a part of itself to stay afloat. But from a user’s perspective, as the underlying rendering and script execution engines become good enough to handle all websites and web apps, the real difference between browsers comes down to the features built around the core rendered pages, and even those features are copied from one browser vendor to another. For a while, the main difference between Chrome and Safari for me where whether open tabs were synced via the logged-in Google account or via the device’s iCloud account. The homogeneity of web access, compared to native desktop and mobile software, has meant that the browser itself is deemphasized as a product. 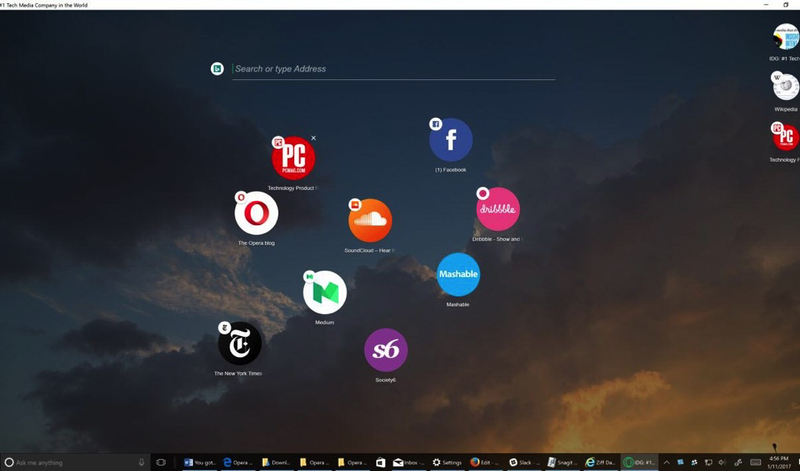 So it was a surprise to see Opera come out with its experimental browser, the Opera Neon. Its timing is interesting too, releasing within a couple of months of the new Vivaldi browser, which itself comes from former Opera employees. On the major OS vendor front, Microsoft took the route to deprecate IE with Windows 10 and is going with an entirely new browser themselves in Edge. After a period where web browsing centered on the major players, suddenly we have a bunch of new entrants to the market. Opera Neon differentiates itself mainly by its slick user interface. Whereas browsers have standardized around tabs on top, Neon makes an effort to make each tabbed page feel like a separate entity. They also include a few nice-to-have features that are almost OS-level: video popouts (which macOS just introduced in Sierra), easy screenshots, and left-right page snapping (introduced back in Windows 7). Of course, these features — and whatever additional ones that Neon will add in the future — are likely to be replicated via each browser’s plugins and extensions if not by the vendors themselves, but Neon’s integration demonstrates a mindfulness with the design that I appreciate. I’ll keep running Neon for a while and see whether it’s worth keeping around. As someone who went through the dark days of browser-incompatible web development, I want to see vendors innovate on the browser chrome and improve the overall browsing experience. The movement to inlined browser windows in apps like Facebook have stripped away a lot of functionality and fundamentally changed how people visit websites; I’d love to see innovation here push people back to using browsers as windows into the open web.